The Fillmore Merchants Association (FMA) has been serving its local merchants for over 110 years. Members of the FMA receive benefits such as marketing, street cleaning, graffiti removal and a network to prevent theft. The FMA’s grand vision is to create a unified and vibrant Fillmore community by fostering a strong local economy through the establishment of a Community Benefits District which would take care of issues such as such as street cleanliness, local business marketing and safety. The team worked with the FMA to research CBDs and how to create one in the Fillmore to bolster the local economy. The research focused on identifying the positive core of communication both within the FMA and in existing CBDs. 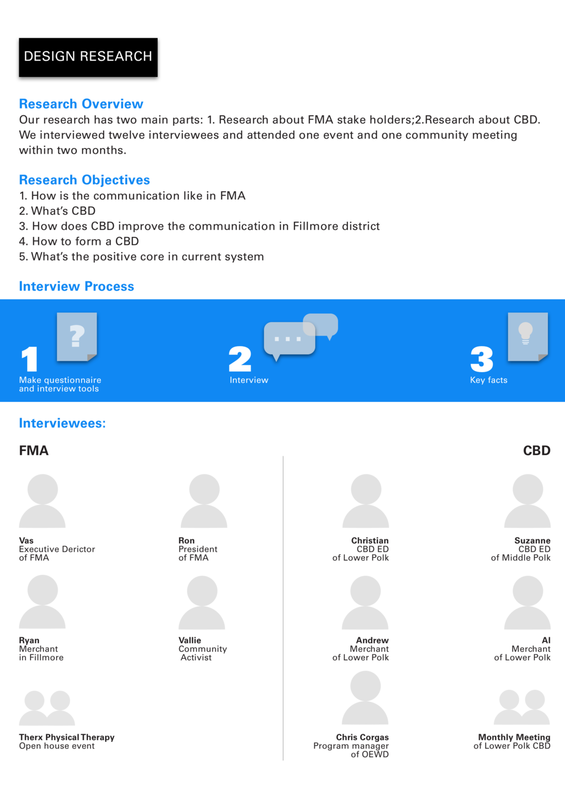 The team interviewed nine people, attended a CBD board meeting and various community events. The Guidebook: A document which contains essential information for someone in the beginning stages of CBD formation. 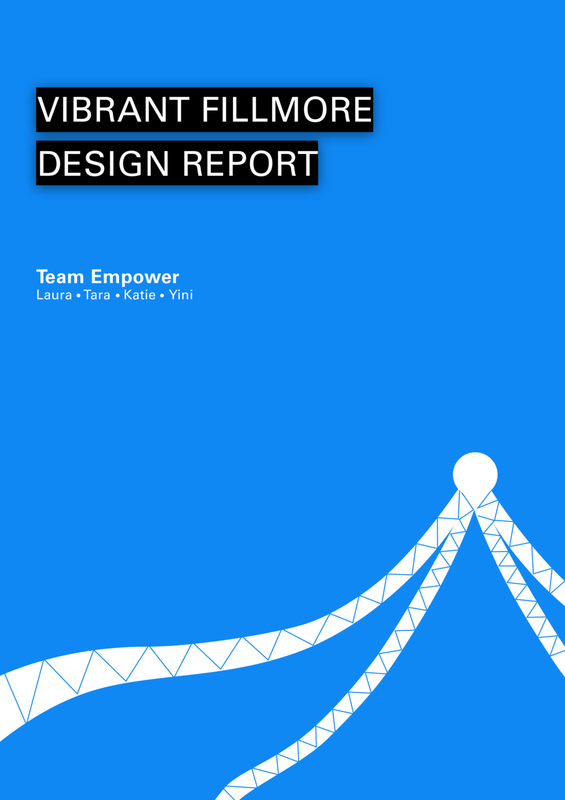 It includes the team's research, interviews and insights. It also includes an actor map, a system map and other research tools they created over the course of this project. Needs Assessment Tool: This was a google survey created to understand the needs of the community. It could be sent as an online link or taken around on iPads within the neighborhood. The team tested this prototype in the Fillmore and received positive feedback. It allowed them to visualize key information about community needs. Educational Video: One of the key insights was that very few people in the neighborhood knew what a CBD was. The team saw value in a simple educational video that explains what a CBD is and how it works. This video could be the on the homepage of the CBD website and the FMA website.